Many opponents of spinning wind turbines point to their supposed danger to birds and other flying animals, as well as their rather noisy operation and – particularly in commercial installations – their enormous size. Though these may well be excuses by those who prefer to stay with older electricity generating technologies that they know and trust, standard wind-driven turbines do have these issues and this tends to hold back their universal acceptance and use. 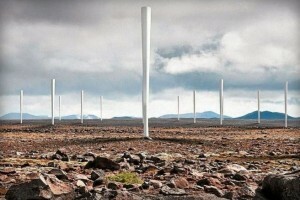 We’ve explored a number of bladeless wind-turbines before – the Solar Aero turbine being one (though, by definition, not really bladeless as it merely covered the spinning blades with a housing) and the Saphonian being another. The latter being more of a true bladeless “turbine,” it still required hydraulic actuation of pistons to generate electricity, so its efficiency was probably not all that great (and, to be perfectly frank, it was not strictly a turbine either as it had no spinning parts). The Vortex, on the other hand, is purported to take advantage of the swirling motion of wind and not direct force like the aforementioned units. This means that it can generate energy from the repeating pattern of vortices (known as the Kármán vortex street), which are generated as the air separates to pass by a blunt body, such as the Vortex structure itself. The first model to be made available commercially will be known as the Mini: a 4 kW, 12.5 meter (41 ft) high unit intended for residential and small-scale commercial application. A larger model, dubbed the Gran, is also being designed and is a unit with a greater than one-megawatt output intended for use in large-scale power generation for industry and electricity companies. To get their creations to production, the team at Vortex will be launching a crowd funding campaign on June 1, with details to become available via email alerts on the company’s website. The short video below shows a Vortex prototype in action and provides some background information from its creators.